A good writer knows their audience, and Roy Spencer knows his. There are plenty of people who would love to hear a compelling argument for why no action is needed to mitigate global warming, and Spencer’s book “The Great Global Warming Blunder: How Mother Nature Fooled the World’s Top Climate Scientists” will give uncritical readers the argument they’ve been looking for. As Sarah Palin said, “while we recognize the occurrence of these natural, cyclical environmental trends, we can’t say with assurance that man’s activities cause weather change”. That is really the essence of Roy’s argument. There was a time at NASA when writing a letter to the paper without your director’s permission could get you fired. And no, I’m not talking about the last Bush administration. 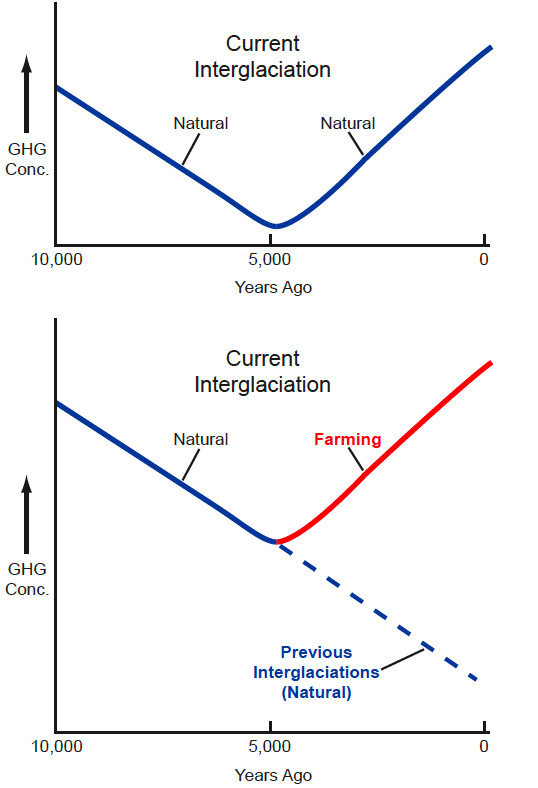 More than 20 years ago, analyses of greenhouse gas concentrations in ice cores showed that downward trends in CO2 and CH4 that had begun near 10,000 years ago subsequently reversed direction and rose steadily during the last several thousand years. Competing explanations for these increases have invoked either natural changes or anthropogenic emissions. Reasonably convincing evidence for and against both causes has been put forward, and the debate has continued for almost a decade. Figure 1 summarizes these different views. Perhaps a way to connect with Joe Sixpack? Tagline: If we can pay as much attention to the Earth as we do to our beer, we probably wouldn’t need to worry about global warming. John Samuel McCord, acc. 0882, McCord Museum of Canadian History Archives, circa 1838.